Meeting with Freiburg Fire Service in preparation of urban-forest fire management training (J.G. Goldammer); Waltershofen / Freiburg, Germany. Annual course Natural Hazards and Risk Management within the Master Programme “Forest Ecology and Management”, Faculty for Environment and Natural Resources, Freiburg University (J.G. Goldammer); Freiburg, Germany. Launch of the project Support of Transboundary Cooperation between Uruguay, Brazil and other Neighbouring Countries of South America; GFMC, Montevideo/Uruguay, Brasilia/Brazil. Consultations with the Regional SE European Wildland Fire Network (I. Mitsopoulos, G. Xanthopoulos, A. Dimitrakopoulos) and GFMC (J.G. Goldammer); Thessaloniki / Athens, Greece. Third User Advisory Board (UAB) meeting of DARIUS (Deployable SAR Integrated Chain with Unmanned Systems) project (Objective: To investigate the potential and enable the use of unmanned systems in Search and Rescue operations by increasing interoperability through standardization and homogenization) (J.G. Goldammer); Athens, Greece. Scientific Advisory Board Meeting, Max Planck Institute for Chemistry (J.G. Goldammer); Mainz, Germany. Training of Freiburg Fire Service and associated Voluntary Departments 11 (Waltershofen) and 16 (Kappel) in urban-wildland fire management (J.G. Goldammer., E. Beltrán, L. Pronto); Waltershofen / Freiburg, Germany. National Conference on Fire in Forest Management and Nature Conservation, and burning of heathland demonstration, organized by the Directorate General of the State Forests of Poland and the State Fire Service of Poland and the Regional Directorate of State Forests in Zielona Gora, with GFMC contribution Intentional Burning in Nature Conservation, Biodiversity, Landscape Management and Forestry in Europe and Globally: Historical Aspects, Current Application and Future Challenges (J.G. Goldammer); Osrodek Wapoczynkowy LESNIK, Lagow; and Forest District Przemków, Poland. VI Ukraine Fire Management Week with Second Eastern European Prescribed Fire Demonstration and Long-term Observation Experiment on the use of prescribed fire in wildfire hazard reduction in pine stands and Seminar “Fire Management and Research in Forests, Protected Areas and Natural Heritage Sites” (J.G. Goldammer); Regional Eastern European Fire Monitoring Center (REEFMC), National University of Life and Environmental Sciences of Ukraine (NULESU), Kyiv and Boyarka Forest Research Station, Ukraine. International Tropical Timber Organization (ITTO) evaluation mission of ITTO-supported field project Community-based Fire Management in Ghana (J.G. Goldammer); Kumasi, Ghana. land-use fires or wildfires spread into protected forests. have significantly contributed to the reduction of wildfires in the country. Commemorative meeting of the 40th Anniversary of the large forest fires in Lower Saxony State, Germany, in 1975, organized by the German Federal Agency for Technical Relief (THW), Luechow-Dannenberg Branch, with GFMC contribution Forest Fires in Germany: Retrospective to the 1970s, the Current Situation and the Future (J.G. Goldammer); Luechow-Dannenberg, Germany. Opening of the exhibition by Luechow-Dannenberg County Commissioner J. Schulz, County Fire Chief C. Bauck, GFMC Director J.G. Goldammer and Dr. Michael Herrmann, Head of Luechow-Dannenberg Branch of the German Federal Agency for Technical Relief (THW). The newly opened commemorative exhibition of the 1975 wildfires displays historic photographic materials and other documentation. Mongolia: National Round Table Strengthening Inter-Agency Cooperation in Fire Management and preparation of setting up the Fire Management Resource Center-Central Asia Region (FMRC-CAR) (J.G. Goldammer, O. Byambasuren); Ulaanbatar, Mongolia. The Round Table was chaired by Mr. М. Khurelsukh, Deputy Minister, Ministry of Environment, Green Development and Tourism, and attended by the members of the National Coordination Committee on Forest and Steppe Fire Protection (NCCFSFP) and GFMC. were awarded by the National Emergency Management Agency (NEMA) the State Medal for Disaster Reduction. Mongolia: Field assessment of spring fires in Eastern Mongolia, including transboundary fire between Mongolia and the Russian Federation (J.G. Goldammer, O. Byambasuren); Eastern Mongolia. and forest ecosystems in the NE of the country. 4th Fire Season Public Consultation of Rafina-Pikermi Municipality, Greece, with the presentation of the Guidelines for Rural Populations, Local Communities and Municipality Leaders in the Balkan Region Defence of Villages, Farms and Other Rural Assets against Wildfires (I. Mitsopoulos); Rafina-Pikermi Municipality, Greece. Discussion of the Guidelines by authorities and citizens of Rafina-Pikermi Municipality. First undergraduate training course on Fire Ecology and Management for students of the National University of Mongolia and exercise of under canopy burning in a Siberian Larch (Larix sibirica) forest stand in (Oyunsanaa Byambasuren); Udleg Forestry Research and Training Station, National University of Mongolia. National seminar on “Role of Standardization in Disaster and Fire Prevention”, organized by the Mongolian Agency for Standardization and Metrology, with the proposal for adopting the EuroFire Competency Standards for capacity building in fire management in Mongolia (Oyunsanaa Byambasuren); Ulaanbaatar, Mongolia. Second commemorative meeting of the 40th Anniversary of the large forest fires in Lower Saxony State, Germany, in 1975, organized by the German Federal Agency for Technical Relief (THW), Lüchow-Dannenberg Branch, and Museum of Fire Service History, Lüchow-Dannenberg (Historisches Feuerwehrmuseum Lüchow-Dannenberg e.V.). Panel discussion with authorities of Lower Saxony (Niedersachsen) State, German Federal Agency for Technical Relief, German Armed Forces and GFMC (J.G. Goldammer); Lüchow-Dannenberg, Germany. Meeting with GIZ Programme “Sustainable Management of Biodiversity, South Caucasus” and in cooperation with the ENVSEC / GFMC project Enhancing National Capacity on Fire Management and Wildfire Disaster Risk Reduction in the South Caucasus (J.G. Goldammer); Tbilisi, Georgia. Meeting with the Ministry for Environment, Forestry Agency, on the National Fire Management Policy for Georgia and the implementation plan, an activity of the ENVSEC / GFMC project Enhancing National Capacity on Fire Management and Wildfire Disaster Risk Reduction in the South Caucasus (J.G. Goldammer); Tbilisi, Georgia. Regional Meeting of the ENVSEC Initiative in the South Caucasus (J.G. Goldammer); Tbilisi, Georgia. GFMC lecture and discussion on the theme International approaches in Integrated Fire Management: Are practices or lessons identified of relevance for Brazil at Instituto Chico Mendes de Conservação da Biodiversidade (ICMBio) (J.G. Goldammer, E. Beltrán); ICMBio, Brasilia, Brazil. Consultation meeting with IBAMA President Marilene Ramos, Diretor de Proteção Ambiental and IBAMA Deputy President, Mr. Luciano Evaristo and representatives of the Centro Nacional de Prevenção e Combate aos Incêndios Florestais (PREVFOGO), Mr. Rodrigo Falleiro and Ms. Lara Steil. 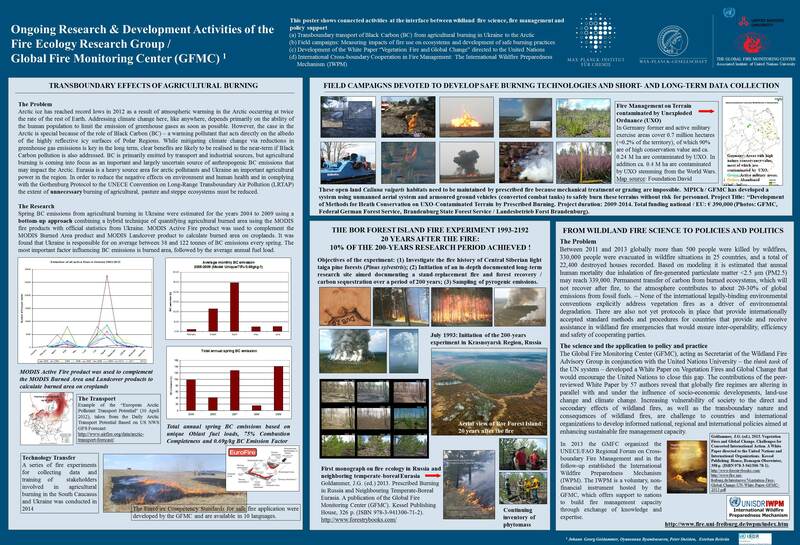 Topics: Past and future cooperation with GFMC and international organizations in fire management (J.G. Goldammer, E. Beltrán); IBAMA, Brasilia, Brazil. Meeting with IBAMA / Prevfogo staff at headquarters, Brasilia. Consultation meeting with Mr. Carlos Klink, Secretary for Climate Change, Ministry for Environment, Government of Brazil. Topics: Past and future cooperation with GFMC and international organizations in fire management (J.G. Goldammer, E. Beltrán); Ministry for Environment, Brasilia, Brazil. GFMC Lecture at Ministry for Environment of Brazil Vegetation Fires and Fire Management: A Global Survey with subsequent panel discussions of representatives of GIZ (Ingrid Prem), ICMBio (Christian Berlinck), GFMC (J.G. Goldammer) and IBAMA / Prevfogo (Rodrigo Falleiro) and Luciana Machado (Ministry for Environment of Brazil ) (J.G. Goldammer, E. Beltrán); Ministry for Environment of Brazil, Brasilia, Brazil. Fire management policy panel discussion at Ministry for Environment of Brazil. Kick-off of the project Support of National and Regional Competency in Integrated Fire Management to Secure Sustainable Forest Management in Uruguay and through Cross-border Cooperation with Brazil and other Neighbouring Countries of South America (J.G. Goldammer, E. Beltrán, L. Steil);Dirección General Forestal, Ministério de Ganadería Agricultura y Pesca, and the Dirección Nacional de Bomberos, Montevideo, Uruguay. Landscape fire management field assessment in Uruguay in the frame of the of the project Support of National and Regional Competency in Integrated Fire Management to Secure Sustainable Forest Management in Uruguay and through Cross-border Cooperation with Brazil and other Neighbouring Countries of South America (J.G. Goldammer, E. Beltrán, L. Steil);Uruguay. Presentation and cooperative planning of participation of Chile in the project Support of National and Regional Competency in Integrated Fire Management to Secure Sustainable Forest Management in Uruguay and through Cross-border Cooperation with Brazil and other Neighbouring Countries of South America (E. Beltrán); Santiago de Chile, Chile. Start of secondment of Lara Steil, Environmental Analyst, Deputy Chief of the National Center of Fire Prevention and Control (PREVFOGO) and Coordinator of the Fire Management Interagency Task Force, Brazilian Institute of Environment and Renewable Natural Resources (Instituto Brasileiro do Meio Ambiente e dos Recursos Naturais Renováveis  IBAMA), Brazilian Ministry of the Environment; GFMC. Sixth Heilbronn Summer Academy Fire and Air  Elements of Nature Feuer und Luft  Elemente der Natur), with GFMC contribution Disaster or Opportunity? The fire landscapes of Earth (J.G. Goldammer); College of Further Education / Volkshochschule, Heilbronn, Germany. Preparation of prescribed burning experiments and operations on Calluna vulgaris heathlands on Sylt Island, in cooperation with Sylt Nature Conservancy (Naturschutzgemeinschaft Sylt) and County Conservation Administration (Untere Naturschutzbehörde Kreis Nordfriesland) (J.G. Goldammer); Sylt Island, Germany. Tablet positioned at the prescribed burn site for public information (left), strong Calluna vulgaris heath recovery one year after the burn (middle), and appearance of fireweed (Epilobium angustifolium) and other successional plants. Photos: GFMC / Sylt Nature Conservancy. Consultations and seminar at the Dienstleistungen im Brand- und Katastrophenschutzfall (DiBuKa) (Services for Fire and Disaster Management, Seehausen, Germany) with attendance of the Minister for Development and Traffic of Saxony-Anhalt State, Germany, Mr. Thomas Webel, with GFMC contribution Herausforderung Feuermanagement  Sind wir für die Zukunft richtig aufgestellt? (Fire Management Challenges: Are we well Prepared?) (J.G. Goldammer); DiBuKa, Seehausen, Germany. International Conference Current Status of Fire Research and Fire Management in the Black Sea and Eastern European Region, with GFMC contributions Challenges for global and regional fire management and needs for cooperation and New approaches and requirements for fire management in the South Eastern Europe, Black Sea and Caucasus Region (J.G. Goldammer), Odessa, Ukraine. Opening of the Fire Management Resource Center-Central Asia Region (FMRC-CAR) (J.G. Goldammer, O. Byambasuren); Ulaanbaatar, Mongolia. Regional Fire Management Training for Mongolia and Central Asia (J.G. Goldammer, O. Byambasuren); Fire Management Resource Center-Central Asia Region and Forestry Research and Training Center of the National University of Mongolia, Batsumber, Tuv Province, Mongolia. preparedness and capacity building with regards to climate change and socio-economic changes. Visiting scientist Jameson Karns, University of California, Berkeley; GFMC. Annual course “Fire Ecology of Tropical, Subtropical and Temperate-Boreal Forest Ecosystems”, Faculty of Environment and Natural Resources, Institute of Forest Science, Freiburg University, Freiburg University (Germany), given by GFMC staff (J.G. Goldammer, E. Beltrán, L. Pronto); GFMC / Freiburg University, Germany. Fifty-first Session of the International Tropical Timber Council and Associated Sessions of the Committees, with GFMC presentation of the Synthesis of the Assessment of the ITTO Completed Projects and the Use of the ITTO Guidelines on Fire Management as a Thematic Group on Forest Fires (J.G. Goldammer); Kuala Lumpur, Malaysia. Field mission of the project Support of National and Regional Competency in Integrated Fire Management to Secure Sustainable Forest Management in Uruguay and through Cross-border Cooperation with Brazil and other Neighbouring Countries of South America (E. Beltrán); Dirección General Forestal, Ministério de Ganadería Agricultura y Pesca, and the Dirección Nacional de Bomberos, Montevideo, Uruguay. Annual meeting of the Directors of the European and Mediterranean Centres of the EUR-OPA Major Hazards Agreement Meeting (EUR-OPA) (Open Partial Agreement on the Prevention of, Protection Against, and Organization of Relief in Major Natural and Technological Disasters), Council of Europe (J.G. Goldammer); Council of Europe, Paris, France. Twenty-first session of the Conference of the Parties (COP) and the eleventh session of the Conference of the Parties serving as the meeting of the Parties to the Kyoto Protocol (CMP) will include the discussion about the accountability of Integrated Fire Management (IFM) in a post-Kyoto Protocol agreement; Paris, France. 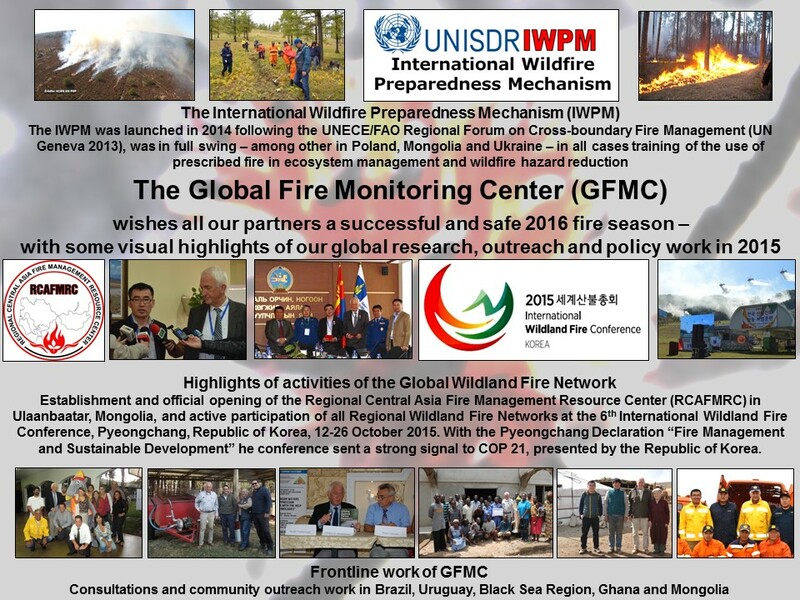 GFMC greetings for 2016: Happy New Year to all colleagues, cooperators and especially the members of the Global Wildland Fire Network, with some visual highlights of the outreach and policy work of GFMC in 2015 (PDF, 0.5 MB).